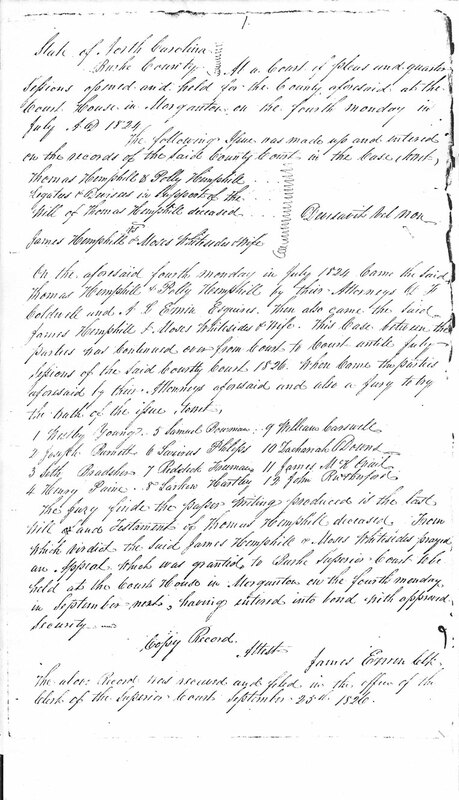 Captain Thomas Hemphill is the ancestor who really got me interested in genealogy, but I’ve had his will sitting in my inbox ever since it arrived in the mail from the North Carolina State Archives in 2009. Yes, almost three years. Why has it been languishing, you ask? Well, it’s not just a will – it’s a contested will – and all the court papers are included, so this little packet is 9 pages of legal-size paper that needs to be transcribed. I needed something to motivate me to tackle this project and I can thank Valerie Elkins, my partner-in-crime in US-Records Study Group for assigning us to transcribe a will as part of our Familiar Records Practices chapter. As soon as I saw the assignment, I knew that the time had come to pull Captain Thomas out of the inbox. Since it is nine pages, I’m going to transcribe and post it one page at a time as a series. Here’s page one 1. The following issue was made up and entered on the record of the Said County Court in the case to wit. Thomas Hemphill & Polly Hemphill by their Attorneys D. F.
There is not much of genealogical significance to be gleaned from the first page, but it does confirm some information found in other, derivative sources. There is also one piece of crucial information implied that conflicts with other sources. I will need to read the remaining pages to be sure I’m correct, but. . .
Thomas Hemphill & Polly Hemphill – this would be Thomas McEntire Hemphill, Captain Thomas’ youngest son (and my ancestor), and Mary Hemphill, an unmarried daughter. James Hemphill & Moses Whitesides & wife – James is either the oldest or second oldest son (Samuel is not proven; he may not be a son or if he was, he likely died before Captain Thomas). Moses Whitesides is a son-in-law, having married Elizabeth Ann Hemphill (two of Moses’ brothers married two of Elizabeth’s sisters, so there are three Whitesides sons-in-law – just to keep things confusing). I have his death date as 4 May 1826 and the source is his tombstone inscription. HOWEVER, this particular stone was placed by the SAR in the 1990’s. His original marker is completely weathered and illegible. James Hemphill, Moses Whitesides & wife originally brought suit over the will in July 1824. They would not have done this unless Captain Thomas was deceased, would they? The case continued over until July 1826. I think the death year on the tombstone has been picked up from this court document incorrectly and that it is really 1824; we’ll call this a hypothesis for now. Stay tuned for more of this estate file in upcoming posts. Tonia, I feel so lucky to have a cousin on this line doing such great research. Are you hoping (as I am) that WDYTYA will be tracing Reba’s McEntire line? I’m looking forward to the rest of your transcription of this will. Thanks for your hard work. We are 2nd cousins, my mother was Edna Hemphill Pendley, your grandfathers older sister. My neice Patti Adams has been following your blog and often sends me your post. I have enjoyed all that she has sent and thought it was time that I joined.. Look forward to reading about your findings. Hi Eileen, I remember you. : ) I’m glad you stopped by and commented. I’ll tell my mom that I heard from you. I am sherry rogers and I live in Mcdowell County. My fourth great grandfather is Thomas Hemphill. I so enjoy that you are interested in genealogy as I am. I am in the Greenlee chapter DAR here in Marion and my ancestor is Thomas Hemphill. My mother is Ruby Suttle Wilson, Her father is John Edgar Suttle, His mother is Mary Ella Wiseman, her mother is Susannah Wiseman Ollis, but susannah was in a common law marriage with John Mackey Hemphill confirmed by the death certificate of my g grandmother ella wiseman. John Mackey’s father wass Thomas Mcentire Hemphill and his father was Thomas Hemphill. Just wanted you to know if you need pics of the area or of the graveyard at ebenezer I can always help since I live here. Hi Sherry! I’ve been to the cemetery at Ebenezer several times, but thank you for your offer! I did not know that John McKey Hemphill was in a common-law marriage. I assume this was after the death of Mary Morrison? Oh, and I love hearing that you are in the Greenlee chapter of the DAR. My great-grandfather’s sister was Kate Hemphill Greenlee. Capt. Thomas Hemphill would be my (5th)great-Grand father, from the Hemphill-Whiteside-Nabors side. Love all this info.